Empowering single parents to live a fulfilling, balanced life, by providing information about parenting, dating and life. This post may contain affiliate links, if you buy a suggested product I will earn a small commission. We are a participant in the Amazon Services LLC Associates Program, an affiliate advertising program designed to provide a means for us to earn fees by linking to Amazon.com and affiliated sites.” Read the full disclosure policy here. Inside: How to make a self-care plan even if you don’t think you have time for self care. Some days are overwhelming. It seems like all you can do to get dressed, get the kids off to school, and get to work. Life doesn’t have to be this way. It is especially hard for a single parent to make time for self care. However, when you are juggling all the responsibilities of running a household, parenting, and financially supporting your family, it is especially important to make time for yourself. Lack of self care makes you more vulnerable to anxiety and depression. At it’s most basic, self care means taking responsibility for your own mental, emotional, psychological, and spiritual health. Too often, mothers neglect themselves or consider it selfish to do something just for themselves. This could not be further from the truth. Being responsible for our own health and happiness is not only the right thing to do, it makes life easier for those we love. When we make others responsible for our health and happiness, it unfairly hinders them. Why is Self Care Important? Whenever I am on an airplane, I am reminded of the importance of self care. The flight attendant always tells you that you need to put on your own oxygen mask first. This is a universal truth: If we do not take responsibility for ourselves first, we are not able to care for others. Lack of self care leads to anger, anxiety, irritability, and a tendency toward depression. Remember that mothers set the emotional tone for the home–especially single mothers who are the only adults in the home. An adult’s anxiety and stress infuses the home with these emotions, which are transferred to our children. When we use good self care, we are calmer and are more likely to foster a peaceful, joy-filled home (of course, there are always exceptions). Good self care doesn’t happen by accident. 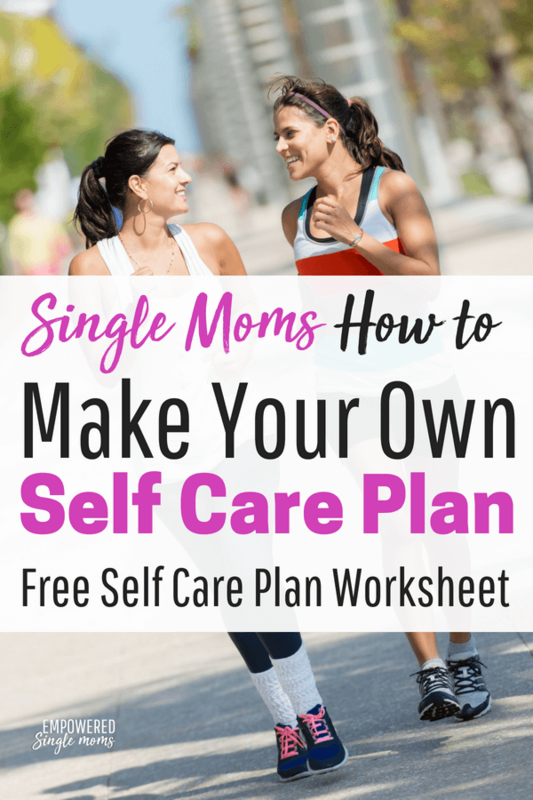 You need to make a plan so that you can use the self-care strategies you need. I developed a self-care plan worksheet to help you. 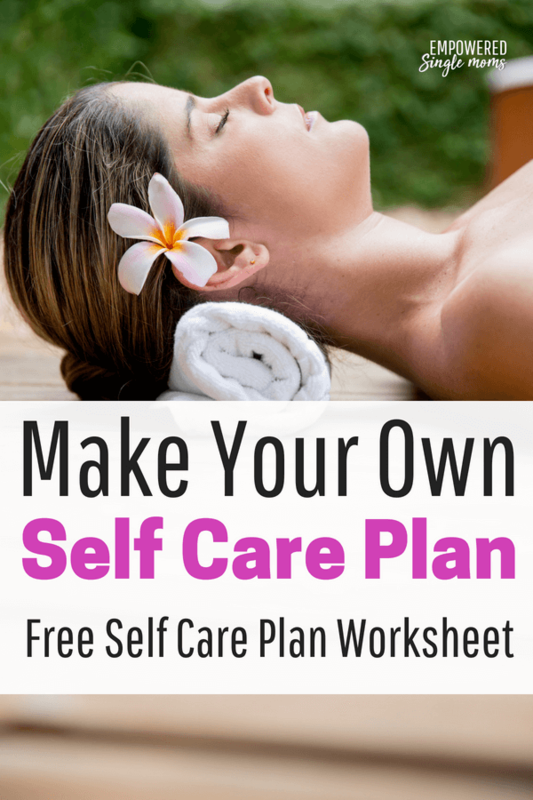 Sign up to get access to the self-care plan worksheet and lots of other free resources. First, identify the areas that are important to you. An effective self-care plan requires two categories of downtime. The first is sleep. One of the most important elements of self care is enough sleep. Most adults need 7-9 hours of sleep per night; however, some people are rested with six hours of sleep and others need ten or more. When you are getting enough sleep, you feel rested, productive, and healthy. You are able to wake up before your alarm goes off or feel ready to get up when the alarm goes off. The second category of downtime is the time when you are awake but able to be relaxed. Examples of this are meditation, prayer, or journaling. Physical exercise is one of the most important self-care strategies. Exercise is a stress reliever. If you use your exercise time to focus on being present, it can also be an opportunity to calm your mind. A brisk half hour walk will even improve your mood. A brisk 45-minute walk is a great way to reduce anxiety. Biking, swimming, and yoga are excellent choices for both physical and psychological exercise. According to research, loneliness is a health risk factor on par with smoking cigarettes and more of a risk factor than obesity. Spending time with friends is not a bonus; it is an important element of maintaining good mental and physical health. Make time to do things with friends. This is an easy one to combine with another self-care need. For example, I have walking dates with friends so I can exercise while I connect with friends. Taking an exercise class with a friend is another good way to exercise while fulfilling your need for social interaction. You could also have a Bible study or book club with friends so you are regularly connecting and feeding your mind or spirit. Time is in short supply, so make the most of it by meeting more than one need with the same activity. I made a private Facebook Group just for you to get encouragement and advice on your single mom journey. We would love for you to join us in Empowered Single Mom Tribe. Reading or learning something new keeps your mind engaged. If you don’t have time to read, listening to an audiobook or an educational podcast while commuting or doing things around the house will keep your mind engaged. Being part of a religious community fosters spiritual growth and social support. If you are involved in a study group or a service group in your religious community, you will enhance your social support system. You can also nurture spiritual growth with prayer and Bible study. If you feel pressed for time, a quick and easy way to do this is to write a verse on an index card and put that card on your bathroom or bedroom mirror to read while you are getting ready in the morning. As a busy single mom, it is too easy to spend all your time cleaning, cooking, doing home maintenance, and being a taxi driver. Those things are important, but without taking time to have fun with the kids and have real conversations, you will end up feeling empty and frustrated with the role of mom. Schedule this time and don’t let anything bump it off the calendar. Where Do I Find the Time for Self Care? You need to schedule small blocks of self-care time each day or at least on most days. Secondly, you will need to schedule larger blocks several times per month. You can make time for both in your schedule in different ways. Find about 30 minutes on most days. There are three times that are most likely to work for this. I am not a morning person, but getting up a half hour early when the kids were home always started my day off calmer than when I was rushing around and hadn’t had a few minutes of quiet time. The end of the day, either after the kids go to bed or once they are studying or doing their own thing, is a good time to get a half hour to yourself. A third option is during lunch, especially if you have an hour-long lunch. Use that time to read or go for a walk. You may find longer blocks of time if you are in a co-parenting situation. Schedule self-care when the other parent has the children. If you don’t have a co-parent, your extended family may be an option. Do your parents want grandparent time? Can you trade off with a sibling so one week you have their kids and the next they have yours for a few hours? This arrangement will strengthen cousin relationships too. If you don’t have a co-parent or extended family who are able to take time with your children, do you know another parent you can trade off with? As a last resort, pay someone to watch your kids. Remind family that money for a babysitter would be a useful birthday or Christmas gift for you. Once my children were teenagers, they didn’t get up until about noon on most Saturdays. If your kids are like mine, you will often have Saturday morning to yourself. Use that time to exercise or get together with friends and not take away from family time. Make your own self-care kit so that you have everything in one place, or assemble a self-care kit as a gift for a loved one. A jump rope or yoga mat, because exercise always helps. Do a few jumping jacks or jump rope and then go for a walk in the sunshine. A self-care journal. Here are some journaling prompts for self-discovery. Pictures of happy times. Photos of good times provide hope of happier and calmer days to come. A balloon, as a reminder to breathe. Focusing on breath keeps us in the present. Don’t pass out because you forgot to put on your own oxygen mask first. You can do this. You do have enough time. 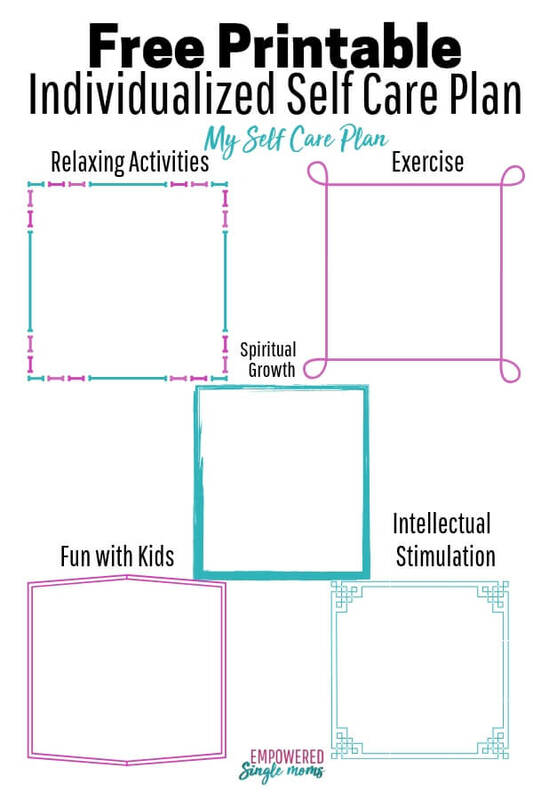 Get the self-care plan worksheet, make your own personalized plan, and stick with it. You are worth it and your family is worth it too! Get the newsletter for more helpful information for free right in your inbox and get access to the free resource library for single moms.